A gunman killed more than 50 people and wounded at least 500 others Sunday night in the deadliest mass shooting in modern U.S. history. The attack took place at an outdoor country music show in Las Vegas, Nevada. A crowd of more than 22,000 had gathered for the Route 91 Harvest Festival, not far from Las Vegas’ famous Mandalay Bay Hotel and Casino. From the hotel’s 32nd floor, police say, a gunman opened fire on the people below. Luke Broadlick was in the crowd. He was recording the performance of musician Jason Aldean on his mobile phone when he heard the sound of gunfire. He moved his camera toward the direction of the noise. His video shows Aldean and other musicians running off the stage. Another Twitter user, Austin Nolson, posted a video from the same moment. In his video, you can hear the sound of rapid gunfire, shots coming one after another. The people in the crowd are lying on the ground, trying to avoid the bullets. The huge Mandalay Bay Hotel is visible. Kodiak Yazzie who was at the concert spoke with the Associated Press. Yazzie was describing the burst of fire coming from the gun high above the concert area. In a two-minute-long video recorded on a cell phone, the first round of gunshots lasts for about 10 seconds. More shots start about 40 seconds later. People can be heard saying, “that’s gunshots,” “get down, stay down.” More bullets come again about 30 seconds later. Before Sunday, the deadliest shooting in U.S. history took place in June of 2016 in Orlando, Florida. A gunman killed 49 people at a gay nightclub. Buddy Dyer is the mayor of Orlando. On Twitter, he expressed his support for the people of Las Vegas. “Our community stands with Las Vegas during this difficult time,” he wrote. President Donald Trump spoke about the shooting Monday morning. He described it as “an act of pure evil.” He ordered U.S. flags to be flown at half-staff to honor those who died. 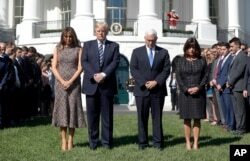 President Trump held a moment of silence at the White House on Monday. “In moments of tragedy and horror, America comes together as one. And it always has,” Trump said. Politicians around the world offered their support for the United States and the people affected by the shooting. I’m Caty Weaver, and I'm Ashley Thompson. Dan Friedell wrote this story for Learning English based on reports by VOANews.com, The New York Times and The Associated Press. Ashley Thompson was the editor. How do you feel about the shooting in Las Vegas? We want to know. Write to us in the Comments Section or on our Facebook page. relentless– adj. continuing without becoming weaker, less severe, etc. solidarity– n. a feeling of unity between people who have the same interests, goals, etc.